wow. there’s a lot in progress i have to discuss today. enumerated list? why, yes! 1. first things first, there is a somewhat new and completely wonderful yarn shop in my neighborhood, hon. if you are a baltimore area fiber aficionado, get on down to lovelyarns today. sue, the owner, is a warm and genuine lady. the shop itself is beautiful, and the yarn selection great- if you don’t see what you need, just ask. it’s that kind of a place. make sure you check out the local handspun, named for the sheep who gave their fleece for each particular skein. and no, she is not paying me for this review, and the gushing she did over my next work in progress in the enumerated list also had nothing to do with my feelings of pure love for her and her shop. just to clear that up. 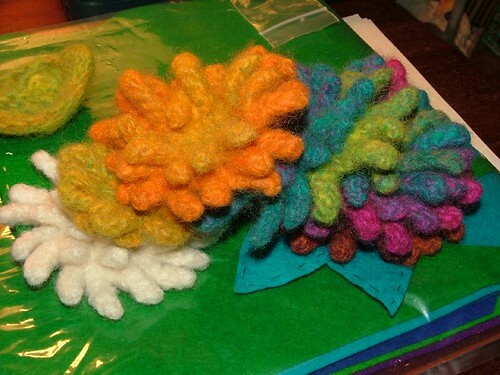 3. woolen flowers: <<<spoiler alert>>> if you are my real-life friend, you may be the recipient of this next item for a certain upcoming holiday. avert your eyes if you’d rather it be a delightful surprise. if you don’t care, neither do i. and, you might just get cookies. i’m heather von marko, and i approved this message. 4. apron artist trading cards: these are for selena’s swap– they are the first i’ve made, and i hope they’re up to par. they are entirely paper, with ink accents. i decided i wanted to create my perfect imaginary world, where aprons, skirts, and wallpaper are all mod-style patterns and bright colors. the letters indicate placement in the series. 5. christmas decorations and gifts: see item 3, above. the great tree debate has begun in my head. the left side of my head wants a tabletop (3 foot) live tree, like we had last year. the right side is not interested in cleaning up dropped needles for months after the tree has rotted in the compost pile. thoughts? if i could find an amazing vintage style fakey tree, like Alicia’s (only bigger? ), that would be something. yuppers, that there would be something. the grandkids on my dad’s side trade names for gifts, and my 3 year old daughter was paired with my 12 year old nephew. there were some homemade gift ideas for boys on whip-up a while back, but none really spoke to me. he may just get cold hard cash. i also have committed to making 3 baby hats, one soon to be four year old hat (more on that in a couple weeks), and a sweater. for a grown man. and i really want to make an afghan for sue’s charitable knitting venture (see item 1, above). oh, and hosting thanksgiving for 10. 6. yeeeaaahhh. stop typing and start knitting…. ps- can you not stop singing that new decemberists duet song, or is it just me? This entry was posted on November 8, 2006 at 11:36 pm and is filed under crafting, musings. You can follow any responses to this entry through the RSS 2.0 feed. Both comments and pings are currently closed. I just received your ATC’s and girl you are one talented ATC maker. They were awesome. In fact I nearly hid them to keep them all myself. I’m serious though, I just adore them. Well done. Thanks for the stickers and tatoos. The children have them all on their arms. Actually Cerys somehow negotiated nearly all of Keirans. He has one and she has 7. She’s just like her dad. Again your cards are fantastic. Well, I was winded just reading this! I love the cards, they are adorable!! You really got all of Nana’s talents, crafting, cooking! *note the jealous tone 🙂 Love ya! 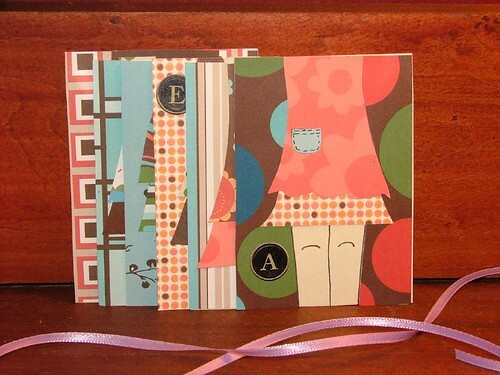 So you made these cards(I love the one with the little knees and the pocket jumper)? I cant handle them (homemade or not) they’re adorable! And I agree if life were perfect there would be mod-syle aprons skirts and wallpaper. Love it! And you guys! Talk to you soon Lady!